Modern meets retro meet techie! This modern pixelated design has a wonderful multicolored retro look to it. The decorating choices are endless with all these gorgeous colors. 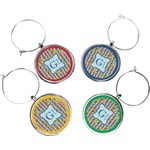 Add a personal touch by putting your name and initial in the center label. 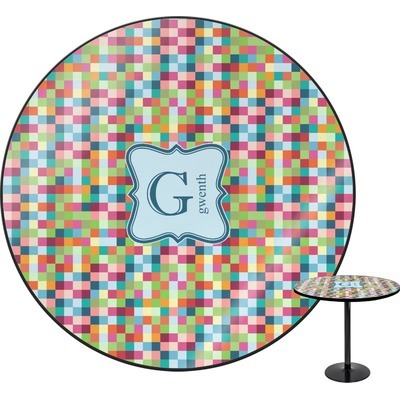 Why settle for an ordinary round table, when you can have a custom and/or personalized table? 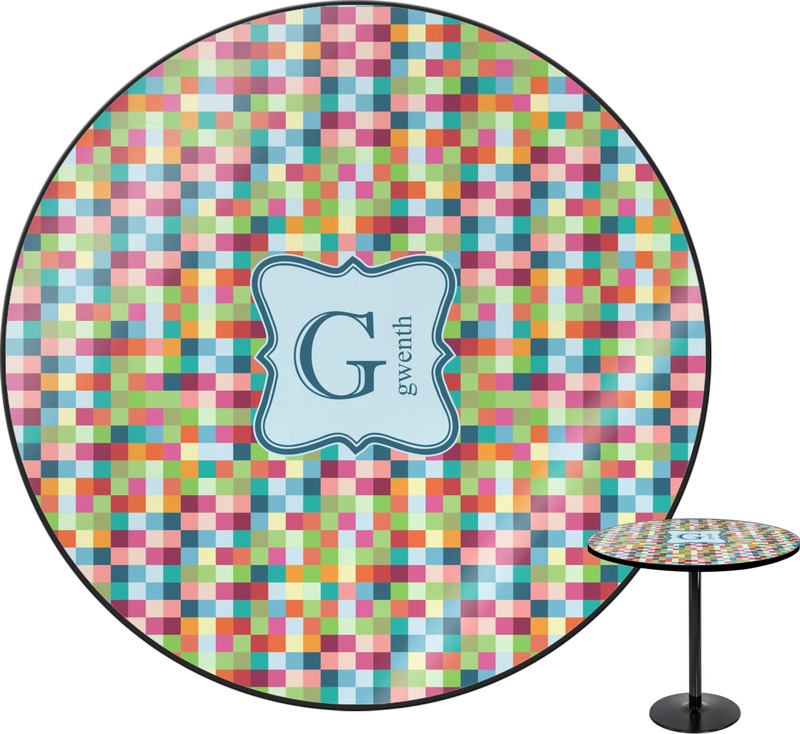 Our custom table tops can be made with patterns, prints, logos, watercolors, famous oil paintings, photographs etc - they are digitally printed in full color, so if you imagine it, we can make it for you. Our multi function table tops can be used as kitchen & dining tables, bar tables, side tables, game tables, coffee tables or even bedside tables. You add the table legs in the style and height appropriate to the functional use of the table. Follow the leg manufacturers instructions on how to attach the legs to the table. 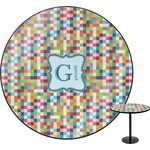 We used Lancaster's round black metal table base (UPC #400010072767) on our round table. The core of our table tops are made from 0.75 inch thick moisture resistant medium density fiberboard (MR-MDF); the tops have a semi gloss scratch, stain and moisture resistant finish and the sides are trimmed with a smooth and semi glossy PVC band. 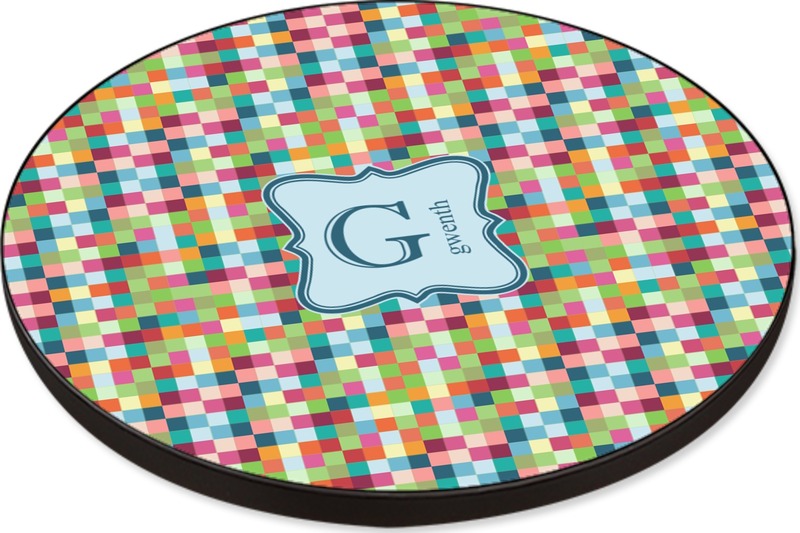 Our round table tops are made in the USA and are available in two sizes - approx 24 and 30 inch diameter. We have created 100's of different designs for you to use as a starting point and to give you an idea of what is possible. Pick a design that you like and start customizing it. You can add / remove / change the personalization; you can change the layout style, the pattern, the color, the graphics and the font. We have thousands of design elements in our customization system for you to select from. You can also upload your own artwork. If you have something specific in mind, contact us and we will try our best to accommodate you.